Bitcoin Press Release: Edited by Stuart Hoegner and featuring a foreword by Jerry Brito of Coin Center, and articles from Bitcoin, law and cryptocurrency experts worldwide, newly-released book The Law of Bitcoin is an invaluable tool for anyone needing to understand how Bitcoin and cryptocurrency intersect with legal frameworks in the United States, the United Kingdom, Canada and Germany. 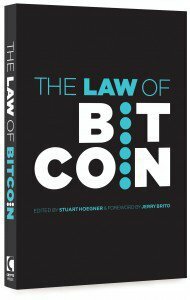 Published in July 2015 and available now, The Law of Bitcoin is a response to the great interest and need for a text focused on the law of cryptocurrencies, especially Bitcoin. This book is the first of its kind delving into cryptocurrency law in four jurisdictions: the United States, the United Kingdom, Canada and Germany. Written by knowledge leaders in the fields of law and cryptocurrency, The Law of Bitcoinaddresses such topics as the intersection of cryptocurrencies and criminal law, taxation, anti-money laundering and counter-terrorist financing regulations, securities law, consumer protection, negotiable instruments, currency law and financial regulation. The Law of Bitcoin is a leading resource and go-to text both for those wishing to understand the basics of how the law affects cryptocurrency and Bitcoin businesses, and also for those in the legal community searching for sophisticated answers to more advanced questions. The Law of Bitcoin team is currently available for interviews with media outletsworldwide. To arrange an interview please email media(at)thelawofbitcoin.com or call +1 416 545 1386. Stuart Hoegner (editor) is a lawyer and accountant in the cryptocurrency and Internet gaming spaces. He represents bitcoin and other cryptocurrency exchanges, leading cryptocurrency entrepreneurs and investors and blockchain 2.0 initiatives. He is General Counsel to the Bitcoin Alliance of Canada. Paul Anning is a specialist financial services lawyer and partner at Osborne Clarke in London. He has a broad range of experience, including experience in M&A and capital markets transactions, establishing private equity and property funds, and advising institutional investors on alternative investments. Mark Brailsford is a Consultant in the corporate tax group at Osborne Clarke in London. Mark has over 25 years of experience in corporate tax and wide expertise in the UK and international tax arena. His primary focus lies with corporate tax and VAT structuring for corporate and financial transactions. Lorna Brazell is a partner in the intellectual property litigation department at Osborne Clarke in London. She acts for a wide range of clients, advising technology-centric businesses in life sciences, digital business, energy, and financial services, and has been recognized for several years as a leading individual in both national and international directories. Jerry Brito is executive director of Coin Center and adjunct professor of law at George Mason University. Jerry is the coauthor of Bitcoin: A Primer for Policymakers, as well as other scholarly works on the regulation of cryptocurrencies. Jerry has over ten yearsâ€™ experience in technology policy and he has testified twice before Congress on cryptocurrencies. Matthew Cleary obtained his J.D. from the University of Colorado Boulder. He has developed a specialty in bitcoin regulation through a seminar paper on the subject and work on future publications. Matthew is an Associate Editor of the Colorado Natural Resources, Energy, and Environmental Law Review. Jillian Friedman is a lawyer and academic with expertise in commercial law and financial services in the e-commerce sector. Jillian is Chief Legal Officer and member of the Board of Directors of the Bitcoin Foundation Canada, counsel to the Bitcoin Embassy (Montreal), and a board member of the Montreal chapter of the Association of Certified Anti-Money Laundering Specialists (ACAMS). Ryan Straus is an attorney and co-chair of the Payments Practice Group at Riddell Williams in Seattle. Ryan has extensive experience in payments matters, including electronic payments, mobile payments, prepaid cards, alternative currencies, and federal and state licensing. Ryan is counsel for industry leaders in the banking, payment processing and cryptocurrency sectors. Michael Taylor is Legal Counsel at Travelex in London, specializing in the legal and regulatory aspects of payment services, e-money, and consumer credit. Michael has worked with a broad range of clients, particularly digital and FinTech businesses. Christoph-Nikolaus von Unruh is a lawyer in Germany and the CEO and co-founder of Dogecoin-based app DogeRain. Nikolaus obtained his law degree from Humboldt University in Berlin and has a Masters degree in company and taxation law. His Masters thesis was on VAT on bitcoin transactions. The Law of Bitcoin team is currently available for interviews with media outlets worldwide.